Campbell, Ian A. and Kat Eschner. "Badlands". The Canadian Encyclopedia, 04 April 2018, Historica Canada. https://www.thecanadianencyclopedia.ca/en/article/badlands. Accessed 25 April 2019. Badlands are dramatic landforms characterized by a network of deep, narrow and winding gullies, along with occasional hoodoo rocks. Their steep, barren slopes provide striking evidence of the force of erosion by wind and water — a source of continual change in their terrain. Areas of badlands occur at scattered locations throughout the Prairies of Western Canada, where they stand in stark contrast to the gently rolling landscape of the plains. 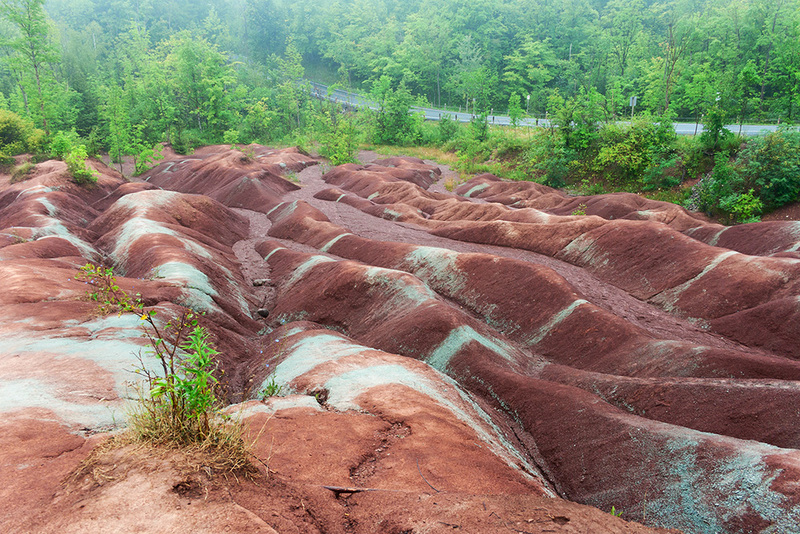 A small area of badlands is also found in Cheltenham, Ontario. It formed after rock exposed through land clearing in the 1900s began to erode into a distinctive badlands formation. 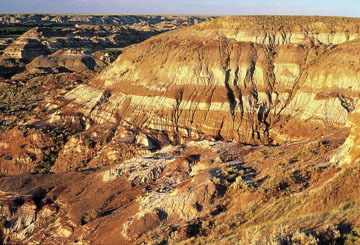 This view depicts the eroding badlands and alternating beds of sandstone and shale (photo by Cliff Wallis, courtesy Cottonwood Consultants Ltd.). Big Muddy Badlands, southern Saskatchewan (photo by Brian S. Sytnyk/Masterfile). Badlands are particularly prevalent along the river valleys of southern Alberta, especially along the Red Deer River. 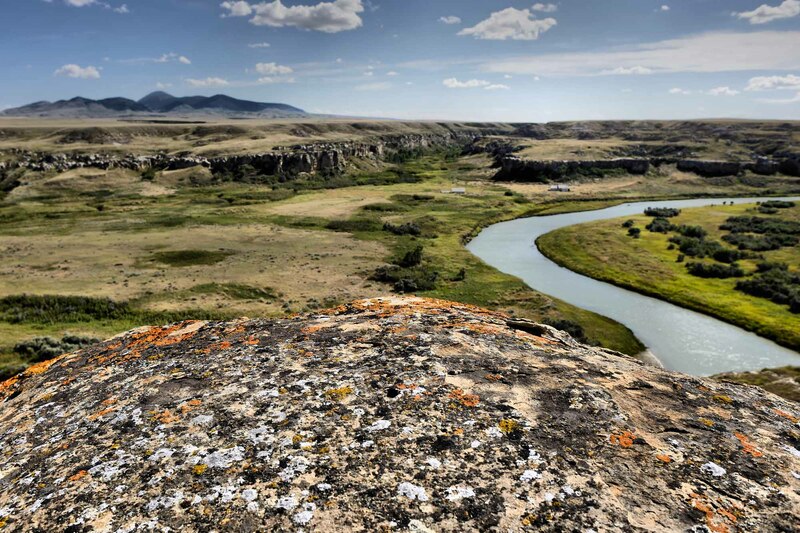 They flank the river for 300 km, culminating in their most impressive display in Dinosaur Provincial Park, where world-famous dinosaur fossils have been discovered. 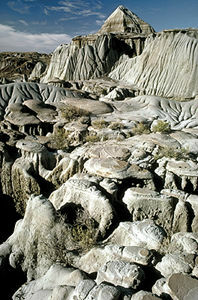 The 7,825 ha park was designated a United Nations World Heritage Site in 1979, partly on the basis of its spectacular badlands, which are the largest in Canada. 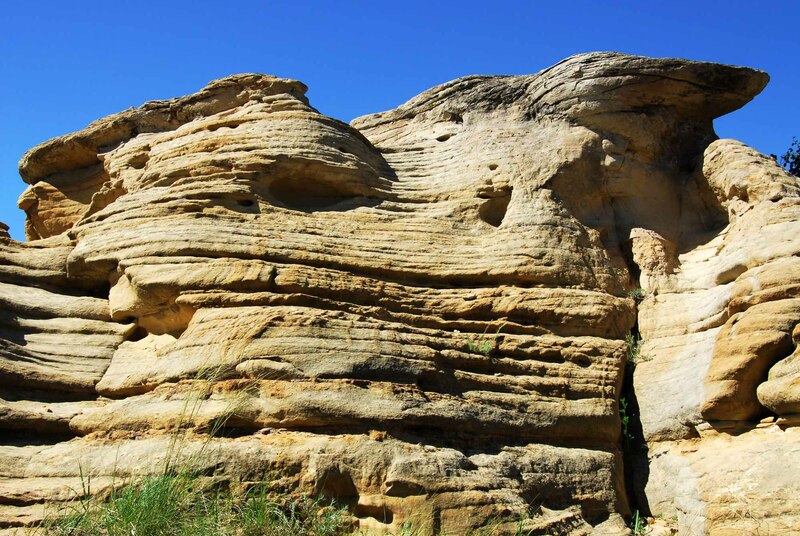 Badlands form where weak, relatively unconsolidated (loose) sedimentary rocks such as shale, siltstone and poorly cemented sandstone are exposed to vigorous erosion processes. They tend to occur in arid or semi-arid regions, where rain often falls in short, torrential thunderstorms. Rapid runoff caused by heavy storms quickly cuts rills (shallow channels) and gullies in the barren, clay-rich rocks, producing rates of erosion of several millimetres per year. Surface erosion is often accompanied by extensive subsurface piping (tunnel erosion) related to existing fractures in the rock. This frequently leads to the formation of sinkholes and slope failure (e.g., mudslides). Badlands are always changing. 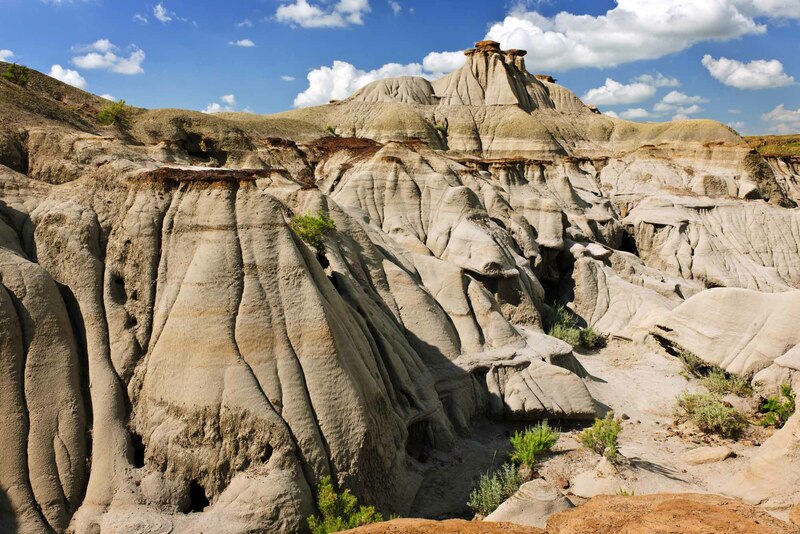 Badlands form where weak sedimentary rocks such as shale, siltstone and sandstone are exposed to vigorous erosion (courtesy Canadian Tourism Commission & Ocean Images). Many of Alberta’s badlands were initially formed as a result of rapid channel downcutting (erosion) by glacial meltwater during the retreat of the Laurentide ice sheet about 13,000 years ago in the late Wisconsinan period (see Glaciation). The steep valley walls, cut into the soft Late Cretaceous rocks that dominate the bedrock geology of southern Alberta, were ideal for the development of badlands. View of the Badlands and hoodoos in Dinosaur provincial park, Alberta, Canada. 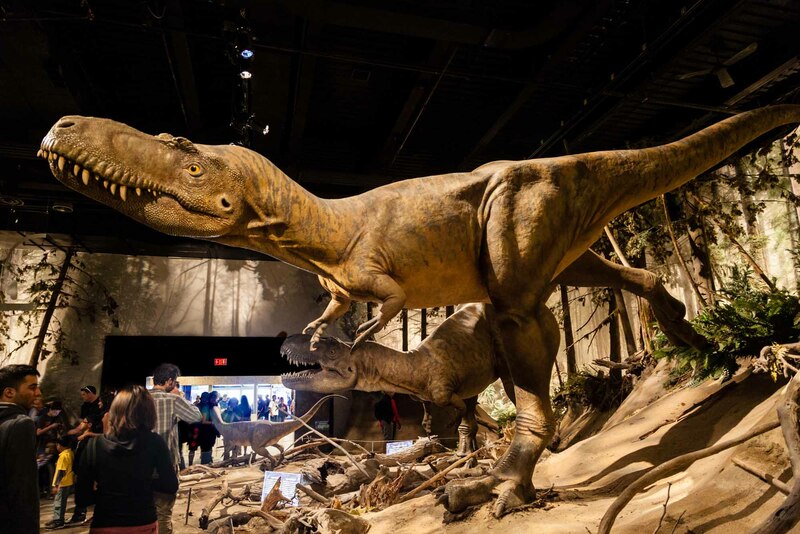 The fossil record preserved in Dinosaur Provincial Park shows that the badlands of southern Alberta were once home to about 35 species of dinosaurs — among them, the carnivorous albertosaurus, which was discovered by paleontologist Joseph Tyrell in 1884. These fossils date back to the Late Cretaceous period, which ended 66 million years ago. A number of species currently occupy Alberta’s badlands. These include the prairie rattlesnake, the short-horned lizard and the western small-footed bat. 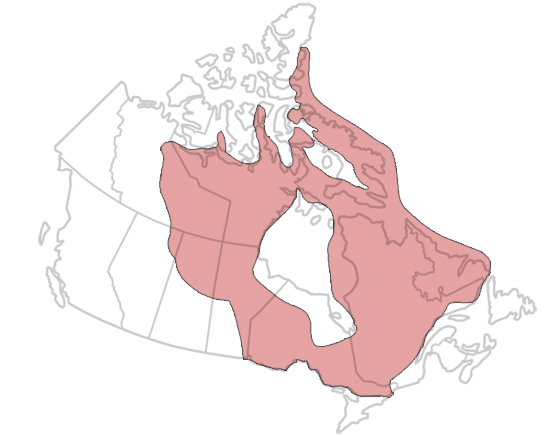 In Alberta, the badlands are the only place where this species of bat is found, and it is considered a Species of Special Concern by the Province. The short-horned lizard is classified as Endangered (see also Endangered Animals). 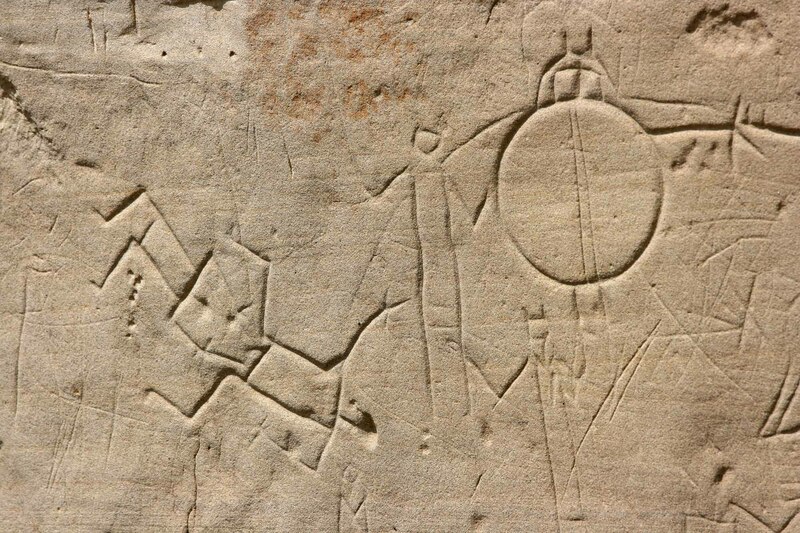 Petroglyphs (rock carvings) in Writing-On-Stone Provincial Park, Alberta. Landscape featuring the Milk River Valley from Writing-On-Stone Provincial Park. Landscape featuring the rock formations from Writing-On-Stone Provincial Park. The park is located in Milk River Valley, south of Alberta. 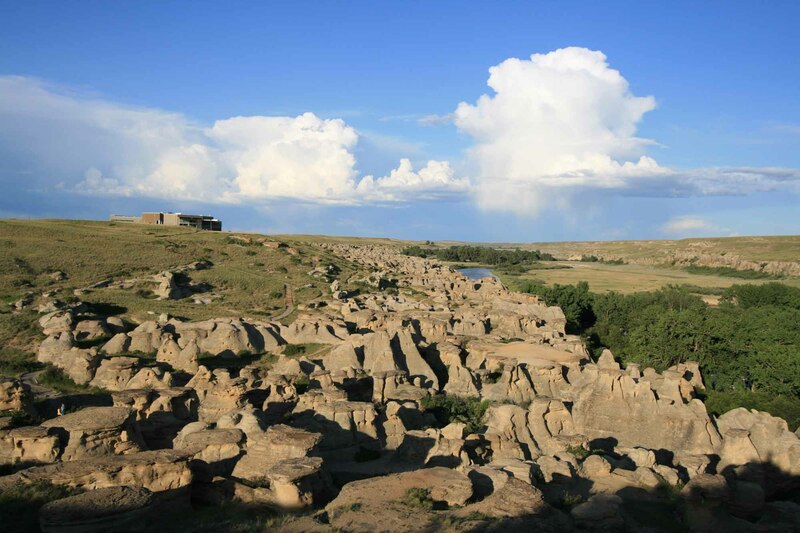 It consists of rolling grasslands, hoodoo fields and narrow sandstone canyons. Many ancient artifacts and archaeological remains have also been found here. 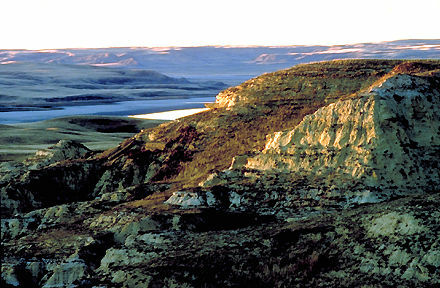 The southern Alberta badlands lie within the traditional territory of the Siksika (Blackfoot) people. Writing-on-Stone archeological site, which the Siksika call Áísínai'pi, is a traditional sacred site containing many pieces of rock art of great spiritual significance. The French, who were among the earliest explorers in the interior of western North America, described such places as mauvaises terres à traverser, meaning “bad lands to cross.” This is the source of the English term badlands. Today, the culturally and scientifically significant badlands of southern Alberta draw thousands of visitors every year. 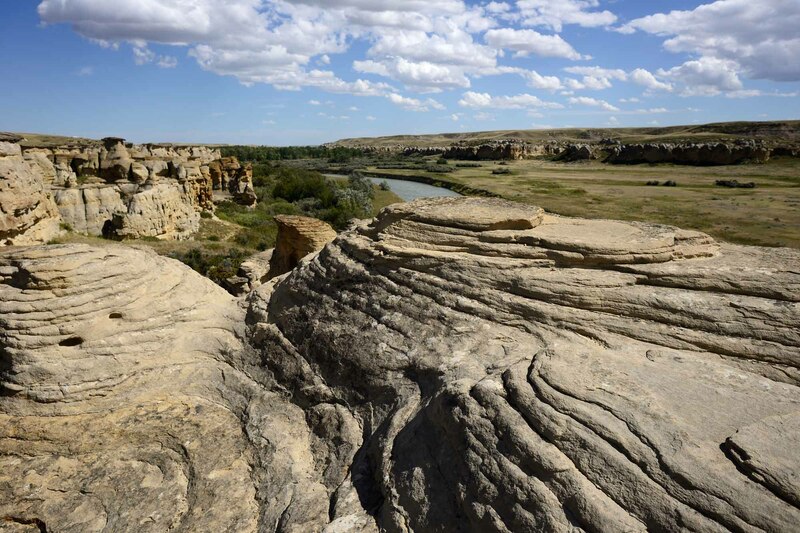 However, visitor access to both Dinosaur Provincial Park and Writing-on-Stone archeological site is controlled and monitored to prevent unnecessary erosion and other environmental impacts (see also Conservation). 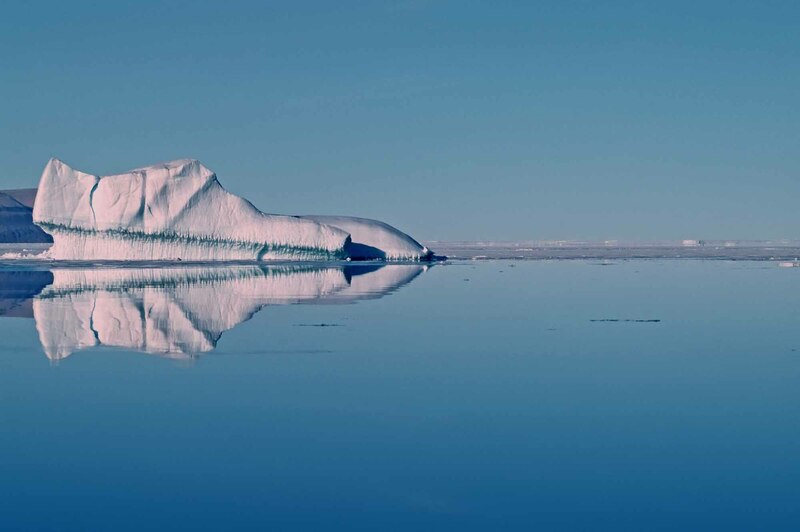 Research by paleontologists and archeologists continues in these parks, while their stewards try to balance the obligations of caring for these unique sites. Royal Tyrrell Museum The Royal Tyrrell Museum, Alberta's renowned palaeontology museum and research facility, invites visitors on a virtual journey through geological time. View toothsome dinosaurs and other fossilized life forms. Daspletosaurus torosusAbout the discovery of Daspletosaurus torosus fossils in Alberta. From the Canadian Museum of Nature. Joseph Tyrrell Watch the Heritage Minute about pioneer geologist Joseph Tyrrell and his discovery of the massive dinosaur fossil beds in Alberta. From Historica Canada. See also related online learning resources.